Earl Hill, Wes Powell, Ryan Johnson and Mikael Jaaber practice Feb. 1. It took a while, but Carver College and Career Academy’s boys basketball team has risen near the top. Head coach William “Reggie” Simon Jr. took over at the Chester-based high school four years ago. His first team won five games and lost 12. His teams went 10-12 and 12-9 over the next two years. This year’s edition had a 15-5 record heading into Tuesday’s game with King William. A win in that contest would result in Carver having the top seed in the nine-team 1B Region, Simon said. With a 10-1 record, the team had already clinched their seven-team Tidewater District regular season crown. Simon came to Chester after coaching at Hopewell High for 21 years, 15 as an assistant under Bill Littlepage and six years as head coach. His varsity teams were 92-62. The Hopewell probation officer said the keys to his team’s success this year are: 1) defensive pressure, and 2) balanced scoring. The Wolverines use either full- or half-court pressure defense almost all the time, Simon said. 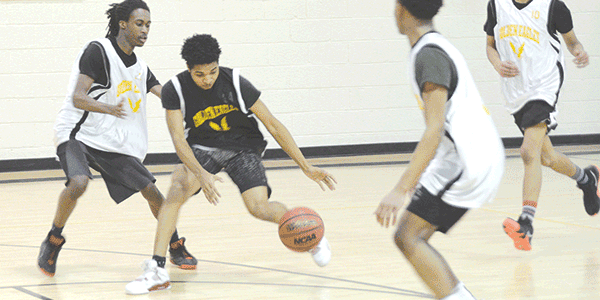 They have a rotation of nine players on the varsity squad, which is led by senior combo guard Mikael Jaaber, who averages 19.6 points, 2.9 assists and 2.4 steals a game. The team’s next leading scorer is junior point guard Travis Williams, who averages 9 points and 5.1 assists. Senior forward Damian Mosher is next, with 8.4 points and 6 rebounds. Junior guard Earl Hill averages 7.1 points, and junior center Rome Hudson averages 5.4 points and 8.1 rebounds. Key reserves include senior forward Michael McQuinn and three juniors: forward Corey Atkins and guards Zyaire Muhammad and Ryan Johnson. In addition to King William, the Wolverines compete in the Tidewater District with King and Queen Central, Charles City, Mathews, Middlesex and West Point. All of the teams in Carver’s district are in the 1A Region, except for Carver and King William, which plays in the 2A Region. This is a quirk that Simon said is supposed to change for the 2019-2020 season. In the 1B Region, Carver is currently ranked ahead of Altavista, Appomattox Regional Governor’s School, Cumberland, Lunenburg Central, Rappahannock, Riverheads, Stonewall Jackson and William Campbell. The Wolverines have played several games against larger schools this year. They’ve played 3A Colonial Heights twice and 4A Portsmouth Churchland once. All three were losses, but Simon said he wanted to challenge his team and prepare them for the postseason. “It’s our toughest schedule (in four years),” he said. Carver did not play in the regional tournament in 2016. They went 0-1 in 2017 and 1-1 in that tourney last year. Simon is hoping for a better performance this year. Carver will host a district tournament game Friday, Feb. 8. If they win, they will host another game Tuesday, Feb. 12. Should Carver win the district tourney, they will host the regional tourney beginning Monday, Feb. 18. Any regional tournament games that Carver hosts will be played at another local location because the venue has to be able to seat more than 1,000 fans. Carver’s small seating section doesn’t qualify. 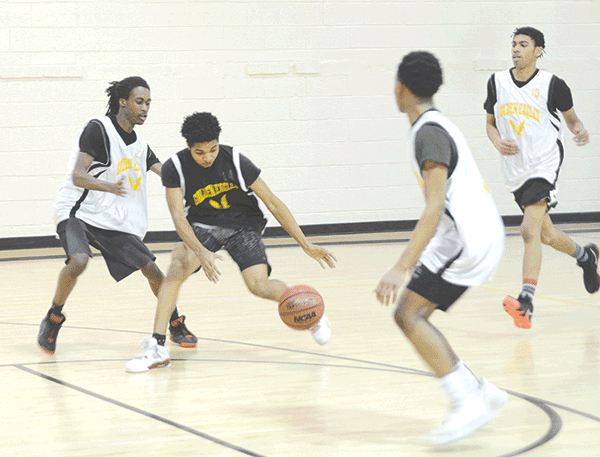 Wherever they play, Carver Academy’s Wolverines will be looking to press their way to success.